This February I was fortunate enough to receive a scholarship to attend the annual Cheese Maker’s Resource Conference in New Holland, PA. This was my first time attending any cheese making conference. At the beginning of the conference we were all given a 3 ring binder. This binder contained all of the presentations and resources from the event. That means that even if you couldn’t attend a session, you still had all of the notes from that session. This is a wonderful resource that I will use over and over again. For the first two sessions, I attended a talk about Marketing and Agri-tourism. At Fuzzy Udder Creamery, I am the marketing and wholesale manager. In the future I hope to integrate more Agri-tourism into our farm. It was very interesting to see what other farms are doing to add agri-tourism. I walked away with new ideas that I hope to implement at Fuzzy Udder in the future. At the last minute, a spot opened up in the hands-on cheese making class with Fons Smits and I was able to be part of that class. The first day we went over the cheese making process of a washed curd cheese like a gouda or baby swiss. We went over the basic cheese making process of a washed curd cheese, what cultures to use and renneting. We also went over how to troubleshoot your cheese. For example if your cheese is too sour, you might need to increase the amount of washing water and the temperature of the water. On the second day, we held the hands on part of the class, where we actually made cheese. We made a gouda style cheese. It is very interesting to learn from different cheese makers. Each one has a very different style. Last year I took a class from Ivan Larcher, who doesn’t brine his cheeses at all and advises against it. On the contrary, Fons brines almost all of his cheeses and highly recommends it. I think learning from many different cheese makers allows you to find the process and cheese that works in your facility and with your milk. I left the workshop inspired and excited to make cheese! One of my favorite parts of the conference was meeting and socializing with other cheese makers. I met many cheese makers from across the country. Some had vastly different operations than ours and some were similar. It was wonderful to network with people in the same field and make lasting connections. And of course at a cheese making conference there was lots of cheese! It was great to try so many different types of cheese. They held a Cheese Extravaganza one night, that featured many recipes using cheese as well as cheese pairings. It was exciting to try Parish Hills Cornerstone cheese. There were cheese soups, cheese sliders, cheese balls, basically anything you could make with cheese! They also gave you all of the recipes so you could go home and make your favorites. Overall, I was highly impressed by the Cheese Maker’s Resource Conference. I hope to make it an annual event and attend every year. I enjoyed my first trip to the Cheese Maker’s Resource Conference in New Holland, PA. As it is titled, there was a strong focus for cheese makers. While there was a little bit of information for marketing, mongering and managing, much of the conference focused on the needs o f cheese makers. Several technical sessions caught my eye, most notably the Cheddar series and the Affinage series. Dave Potter from Dairy Connection was the instructor for the cheddar sessions. He focused on the cheddar make process- including acid production in the vat, not during the aging process. Dave talked in detail about the factors that can influence the quality of the aged cheese. Rennet type can affect the final cheese taste as different rennets cut the proteins in different lengths. Some cheeses cultures can continue to digest the proteins in aging to minimize the bitterness. Rennet action can also be affected by the pH of the milk- it will work faster at a lower pH. Curd cutting time can influence the moisture of the cheese: a firm set will give a softer cheese, a soft set will yield a firmer cheese that will also be drier since some fat will be lost too. After cutting, healing is an important step, without it, you will lose fat. Consistent heating in the cook step is better than a steep rise in temperature. Milling step is important to increase surface area of the curd to absorb salt, also allowing more surface area for whey to escape during pressing. Salting should be broken up into 3 steps as too much salt to fast, it will be lost in the whey drain off. After draining/pressing, cheeses would be moved next to the aging space. Peter Dixon presented three sessions on affinage. He began by covering environmental conditions: temperature, humidity, ventilation(air mixing), and oxygenation(air exchange). Temperature can influence what is growing on the cheese during aging- for example, yeasts like cooler temperatures(37-72F) than Coryneforms(50-60F). Humidity can influence the thickness of the cheese rind. Ventilation is important, but too much will dry out the cheeses. Air exchange is important to remove build up of ammonia in the aging space. The second affinage session focused on the cheese caves, cellars and aging rooms. Cellars are close to the make room and have a lower construction cost. An aging room is usually the lowest cost and is easy to construct. Dedicated aging space is important to provide stability for the cheese where the temperature, humidity and ventilation can be regulated. Cooling is usually accomplished with refrigeration systems, with ventilation and humidity affected by temperature. Cheese aging space can be calculated by figuring 1cu. Ft of cheese weighs 80lbs, with 30 cu ft of space needed for 8o lbs of cheese for aging (50 cu ft if drying the cheese). Different types of cheeses will require different conditions. Wood shelving can be used to minimize moisture loss from cheese since it will either absorb or give off water depending on the humidity of the room. In the interest of food safety, Peter was emphatic that water should not be put on the floor to increase humidity- the air should be humidified, not wetting the floor. One of the reasons I was excited to attend this presentation is because it has been difficult to find resources for designing a cheese cave for aging our cheeses. Peter recommended the Profession Fromage’s The Cheese Ripening Guide as one of the most comprehensive resources he has found. Overall, I found the conference to be very beneficial. The only disappointment was that there was no trade show. There was a lot of time for cheesemakers to network during breaks and meals, which was a great opportunity. The American Cheese Society annual conference for 2018 was held in Pittsburgh, PA. I attended several sessions and a full day workshop on Food Safety Plan development. The Deep Dive and Coaching for Developing a Food Safety Plan(FSP) was a heavy start to the conference for me. It was the first session that I attended, and was solely dedicated to writing components of the Food Safety Plan that comply with the new FSMA rules that have been under development in the last few years. The workshop was staffed by Cooperative Extension Educators from Cornell, Ohio State, Iowa state and the Dairy Practices Council. In this packed session, attendees had varied levels of experience with Food Safety Plans. Several, like myself, were just starting the process of documentation while others were well versed in writing plans, but wanted clarification about the new rules. We were given two great resource binders: Artisan Dairy Food Safety Plan Coaching, and Artisan Dairy Food Safety Plan: Templates. Both resource binders have been incredibly helpful to me in the time since as I work on my plan. Other resources include a Food Safety Plan Builder on the FDA website, although instructors cautioned that there are some components missing and that the strength of the site is the hazard analysis guidance. The ACS has its own Safe Cheesemaking Hub (https://guides.cheesesociety.org/safecheesemakinghub), which acts as a clearinghouse for resources: links to templates, additional opportunities for trainings, online courses and many other resources. The workshop began by defining some of the terminology that is used in the new format for FSP and reviewing the parts of a FSP. For example: Allergens are considered Chemical Hazards. A helpful tip the instructional team provided was to start general and work your way to become more specific. Begin with a written description of each product and the distribution, the intended use and customers, then more to the more specific parts, like a flow chart for the make process for types of cheeses. Similar products can be grouped in one flow chart: cheddar cheese would use a very similar flow chart to a cheddar cheese with herbs added. The type of cheese remains the same, with additional step(s) of adding the herbs. My biggest impression of this workshop day was to begin with the resources you have and build on them until your plan is complete. The hardest part is to get started without feeling overwhelmed. There is a lot of help out there as well as additional trainings. Our Maine Cooperative Extension staff is also very helpful and can provide review of plan components. The remaining sessions I chose to attend focused on local foods and foods systems- being from a small state and having a small creamery, these talks were very interesting to me. Transhumance, Terroir, Old and New Frontiers in Bandaged Cheddars, Drink Apples and Eat Cheese- All of these workshops focused on the relationships between the place and geography of a food and the culture of the people making the food. Transhumance and Alpage cheeses focuses cheese production on the seasonal availability of grazing land higher altitudes in the summer and lower valleys in the winter. It is the ultimate in terroir- the taste of place- as the cheeses can change based on the forage the animals are eating. It is truly an economy built on the landscape of the area and the influence of the terrain is unmistakable While we do not have high mountains on our farm, we do notice a change in our cheese during the seasons and based on the pastures we are rotating our cattle through. The tasting session for bandaged cheddars had an interesting twist of tasting cheeses of different ages from the same creamery as well as cheese that was made in one creamery and aged in two different aging spaces. There was a remarkable difference in the finished cheeses although they had the same origin. The microbes of the place in which they were aged exerted their influence on the finished cheese. In addition to tasting the cheeses, we also had the opportunity to smell the aging spaces! Cotton balls were left in place for a period of time to absorb the atmosphere, then placed in a sealed vial. It was remarkable to smell the caves and then taste the cheeses- it was like being transported to England! The cider and cheese tasting session was the ultimate in terroir- pairings of Pennsylvania hard ciders and cheeses. This type of pairing presents marketing opportunities for creameries to partner with local cider makers. This seems like a very historical pairing of artisanal foods- where many farmers would have had cows (or goats) and apple trees on their farms. Hard cider and cheese were likely staple foods for farm families. European cheese makers and governments have recognized the value of preserving their food heritage by instituting standards for foods with Protected Designated of Origin and other programs. 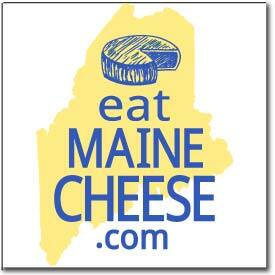 While Maine cheese makers utilize old world cheese methods and recipes, there is no doubt that the cheeses made in Maine are unique to our place and special in their own right. The cheese sale at the end of the conference is a great way to pick up new cheeses to enjoy at home. I lugged home a small bag of cheese that I broke down into smaller pieces to enjoy over the next several months. As a New Englander, I am partial to cheddars- there was a great variety to inspire me in my own cheesemaking!